People are returning home after several years of conflict and displacement, but the Iraqi government faces significant challenges to ensure safety and stability, functioning infrastructure, and access to basic services and job opportunities. ? Relations with the autonomous Kurdish Region of Iraq (KR-I), which voted for independence in September 2017, remain fragile. ? Some 10,000-15,000 IS militants are believed to remain in Hamrin Mountains, Kirkuk governorate, Mosul, the southern part of Ninewa governorate, and the desert areas of Anabar governorate. ? Almost 65% of all people in need are concentrated in Anbar, Ninewa, and Salah al-Din governorates. ? Large scale displacement persists despite the expulsion of IS from Iraqi territory. Return movements slowed in 2018 as returnees often face damaged housing, insecurity, and lack basic services and livelihood opportunities. ? Additionally, Iraq hosts 250,000 Syrian refugees, of whom 99% live in KR-I. 69% of all Syrian refugees in Iraq are women and children. ? INFORM measures Iraq’s risk of humanitarian crisis and disaster to be very high, at 7.2/10. Hazard and exposure as well as lack of coping capacity are of particular concern, at 8.6/10 and 7/10 rates. ? Restriction of movement due to insecurity, bureaucratic impediments, and increasing need for coordination between KR-I and Iraq restrict humanitarian access. ?Unexploded ordnance (UXO), especially in Ninewa and Kirkuk governorates, further hinder access to affected populations. ? 23/04: Continuous heavy torrential rain from mid-March to early April has caused flooding in several communities along the Tigris River in northern, central and southern Iraq. In total, more than 34,000 have been displaced in Basra, Missan and Salah al-Din. 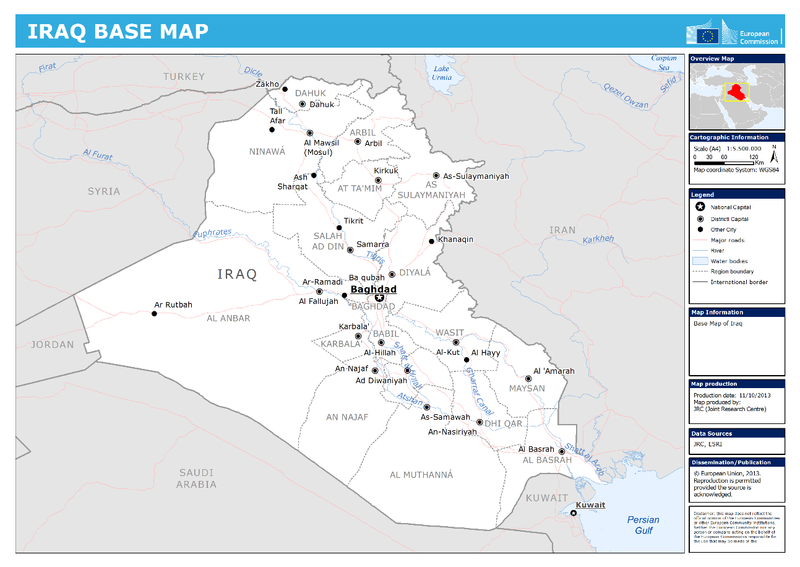 Risk of cholera outbreaks persist in all flood-affected areas, including northern governorates of Kirkuk and Ninewa.? 27/02: Iraqi authorities are hindering humanitarian workers providing aid and services, particularly to vulnerable families associated with or accused of having IS ties. Since January, Human Rights Watch documented more than 22 cases of harassment, physical assault and arrests by governmental officials in Nineveh governorate. ? Health services are severely underequipped and understaffed and 5.5 million people are in need of health assistance. ?Psychosocial support is needed, especially among IDPs. ? Protection is a major concern with 4.5 million people in need of protection assistance. ? Protection needs are particularly high in Anbar, Diyala, Ninewa, and Salah al-Din governorate. Explosive remnants of war are a particular safety risk. ? Food and Livelihoods: 2.5 million people require food assistance and livelihood support, 60% of whom are in Anbar, Kirkuk, Ninewa and Salah al-Din governorates . ? The tracking of IDPs that became refugees and the numbers of refugee returnees is lacking. Their needs and their whereabouts remain mostly unknown. Different delineations of administrative borders between central and regional governments (especially the KR-I) impacts on the accuracy of displacement tracking.